It was only after the Norman Invasion of the late 12th century that Ireland started to be divided into counties of which there eventually were – and still are – thirty-two. Much of this work was undertaken during the 16th century when successive Tudor monarchs encouraged English settlers to take over large tracts of land hitherto owned by the unruly Irish. In 1556, for example, Mary I created two new shires in the midlands, named Queen’s and King’s County after herself and her consort Philip II of Spain. Exceptionally Laois, as Queen’s County has been known since Independence, neither has any sea coast nor borders onto any county which does so. It is therefore the most landlocked region of Ireland and for centuries was controlled by the O’Mores (sometimes spelled O’Moore), the leading family of the region’s Seven Septs. Rory O’More who died in 1557 and his son, Rory Óg O’More were both notable leaders in Ireland’s wars against the Tudors while another member of the same family, also called Rory O’More, would become head of the 1641 Rising against the English. The O’Mores’ opponents included successive generations of Cosbys beginning with the arrival in Ireland of Sir Francis Cosby, a soldier from Nottinghamshire who was granted land in Queen’s County after being appointed General of the Kern (an armed Irish foot soldier) by Mary in 1558. Since this land traditionally belonged to the O’Mores it is not surprising Sir Francis remained in perpetual conflict with Rory Óg until the latter was slain in a battle against English forces in 1577; Sir Francis would himself be killed three years later in the Battle of Glenmalure where the Irish were led by the celebrated warrior Fiach MacHugh O’Byrne (The Irish Aesthete sometimes likes to imagine Fiach as one of his more bellicose ancestors). Sir Francis Cosby was succeeded by his oldest son Alexander who created a residence in the former Franciscan Friary of Stradbally, Queen’s County. The name Stradbally derives from the Irish term An Sráidbhaile meaning a village or town of one street. And so it remains to this day; Stradbally is effectively a long linear street with two openings on the western side forming Market Square and Courthouse Square. Remnants of the old friary survive but in the closing years of the 17th century the Cosbys built themselves an alternative residence which was then added to and embellished by successive generations before it in turn was deemed no longer suitable (the house’s appearance is known from a rare topographical painting of Stradbally dating from circa 1740). In 1766 the estate was inherited by Dudley Cosby, who the previous year had been appointed Minister Plenipotentiary to the Court of Denmark at a time when negotiations were underway for the marriage of Christian VII and Princess Caroline, a sister of George III; that wedding took place around the time Cosby inherited Stradbally and its unhappy consequences are familiar to anyone who has read Stella Tillyard’s 2006 book A Royal Affair. Cosby’s own marriage proved as fatal. Having been ennobled in 1772 as Lord Sydney of Leix and Baron of Stradbally, he embarked not just on the construction of a new house but the courtship of a bride to occupy it. In December 1773 he married Lady Isabella St Lawrence, daughter of the first Earl of Howth. A month later he was dead: whether the two events were related is unknown. Since he had no direct heirs, the peerage lapsed and the estate, with its still-incomplete house, passed to a cousin, Admiral Philips Cosby. He had been born in America where his father was Lt Governor of Annapolis and his uncle General William Cosby Governor of New York. Though Admiral Cosby retired from the Royal Navy in 1782, he was repeatedly recalled to serve during later wars against the French. 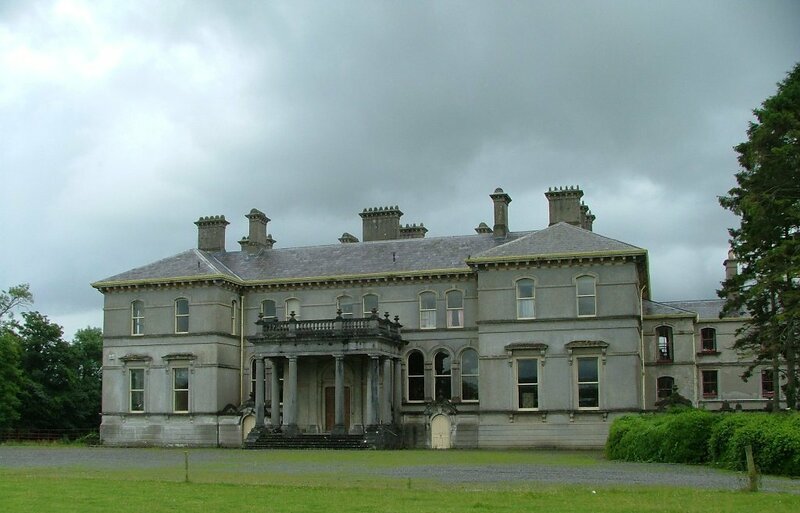 The house begun by Lord Sydney and completed by his heir forms the core of the present Stradbally Hall; of two storeys over a raised basement and nine bays long, its chaste late 18th century classical decoration survives in the three linked reception rooms on the garden front. 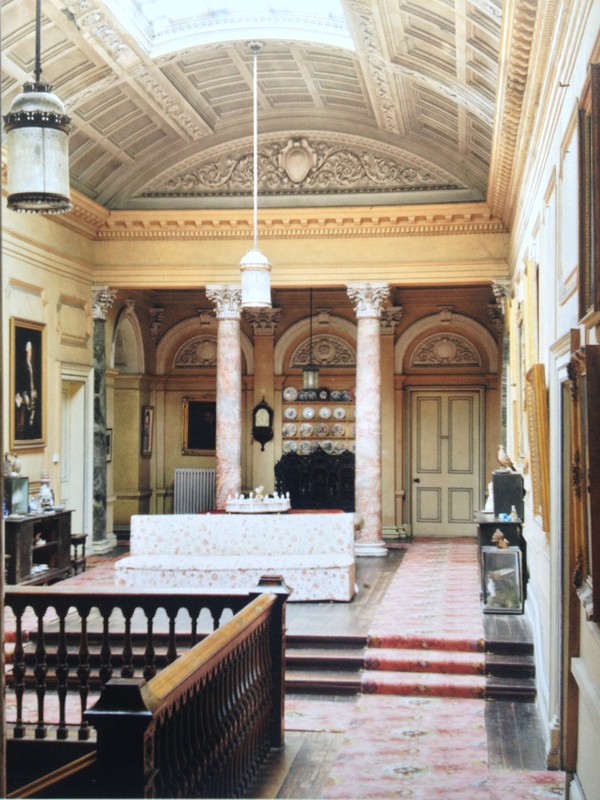 But the building’s external appearance was radically altered during the 1860s when Colonel Robert Cosby employed the architect Sir Charles Lanyon to enlarge and remodel Stradbally Hall. A new entrance front was added to the property featuring two-bay projections on either side of a single-storey Doric portico. Meanwhile on the garden front the house’s existing recessed centre section was filled with a stupendous three-arch loggia and a two-storey bachelors’ wing added to the immediate west. Lanyon also made many changes to the building’s interior, not least the creation of a vast, top-lit central hall. This features a Victorian oak staircase climbing up to a picture gallery some sixty feet long and twenty feet wide above which is suspended a coffered and barrel-vaulted ceiling with glass occupying a considerable part of the space; at either end of the gallery small lobbies were created by the insertion of a pair of pink marble Corinthian columns and each side of the gallery is flanked by a line of bedrooms. Nothing else can match the scale and grandeur of the hall, but some of the groundfloor rooms come close, not least the ballroom which also serves as a library. The most notable feature here is the ceiling, decorated with a series of 24 early 19th century French paper panels telling the story of Cupid and Psyche. And while the basic form of the three interconnecting reception rooms on the garden side remains much as they were when first built in the late 18th century, their decoration is now distinctly Victorian, not least thanks to the gilt wallpaper in the drawingroom. This is what gives the house is unique character: an awareness that no major alteration has been made to its appearance for around 150 years. 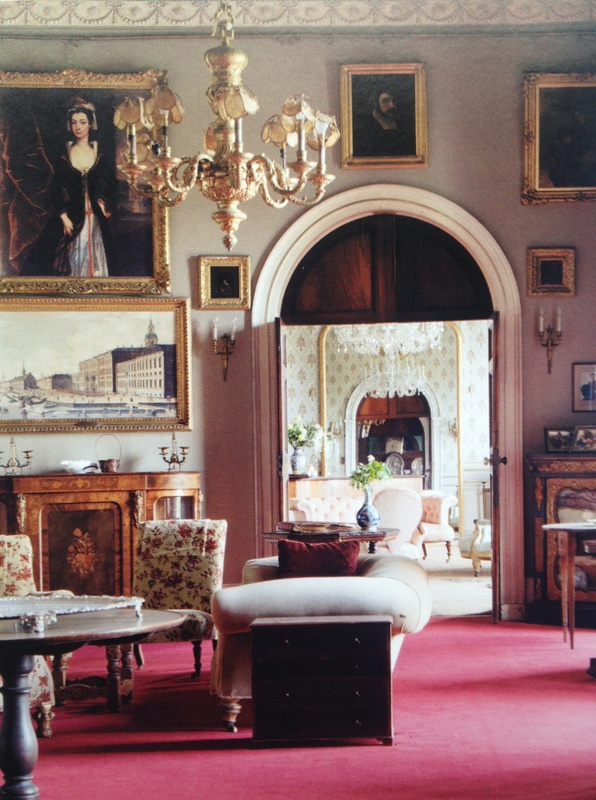 Stradbally Hall’s size makes it plain that this was a house designed for entertaining on a massive scale. The early 19th century Irish memoirist Sir Jonah Barrington, who was born not far away at Abbeyleix, writes of a dinner at Stradbally Hall during which a half-blind guest sitting next to Admiral Philips Cosby mistook the latter’s knobby fist for a bread roll and thrust his fork into it with easily imagined consequences. Still home to the Cosby family, Stradbally Hall is undergoing a vigorous renewal thanks to the attentions of the present generation, Tom and Gesa, who encourage a variety of imaginative activities on the estate. The best-known of these is an annual music festival, the Electric Picnic, which takes place at the end of summer. It’s probably not what Lord Sydney envisaged when he embarked on building the house, but anything that keeps slates on Stradbally’s roof is to be encouraged. 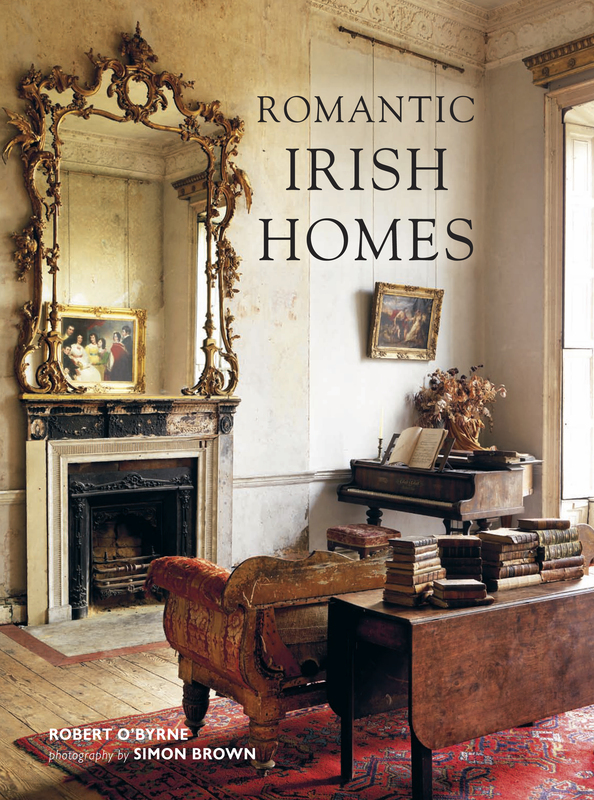 For further information about Stradbally Hall and fourteen other houses, see the new soft-cover edition of my book Romantic Irish Homes published by CICO Books. Incidentally, if you are journalist/blogger who is interested in featuring the book, do contact Mark McGinlay at CICO (publicity@cicobooks.co.uk) for further information and/or to be put on the review copy list. This entry was posted in Architectural History, Country House, Laois and tagged Architectural History, County Laois, Georgian Architecture, Historic Interiors, Interior Decoration, Irish Country House, Stately Home, Stradbally Hall, The Big House. I’m salivating as I read this, and looking forward to seeing your lovely book. Is that a sideboard in front of the chimneypiece in the dining room? Seems unusual, but perhaps it’s boarded up to keep the draft out. The 8 in our town house in Edinburgh were all boarded, because there were no longer used; the days of (someone) fetching and carrying the requisite fuel for fires having long been surpassed by central heating. In houses such as the one you depict however running them at (what I consider) an ambient temperature costs a small fortune. It would be preferable to spend the winter, (or much of the year?!) in a warmer climate, but then you can’t just walk away from these places, otherwise the roof is liable to cave in from rain or snow. It is certainly a labour of love. 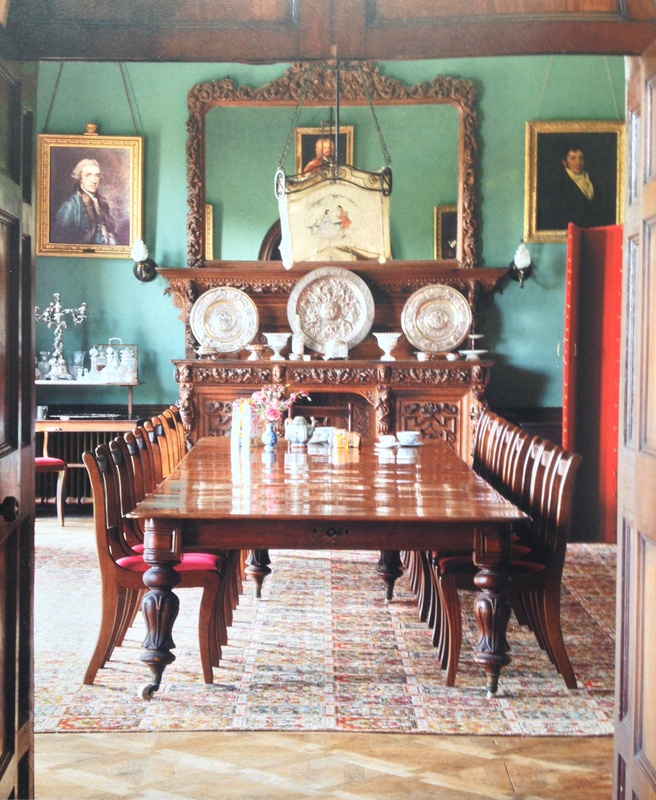 No, that’s all just one enormous 19th century sideboard. 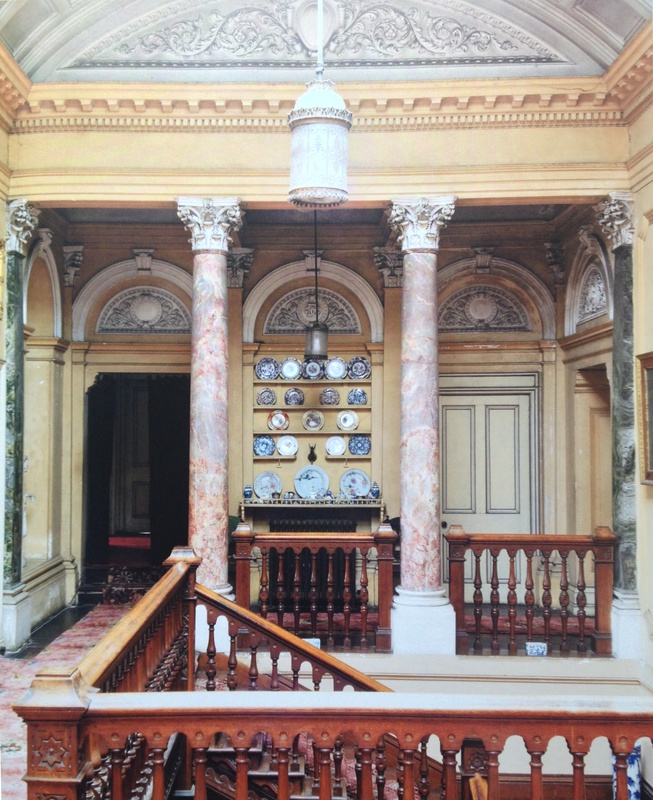 I’ll send you an email attachment of the chimneypiece in the room; like those in the others on this side of the house, it is an example of late 18th century classicism. This is one of the most attractive features of Stradbally: the clash of two very different styles of decorating in the same premises. I didn’t get to stay in Ireland long enough to see these amazing places. I love your books. 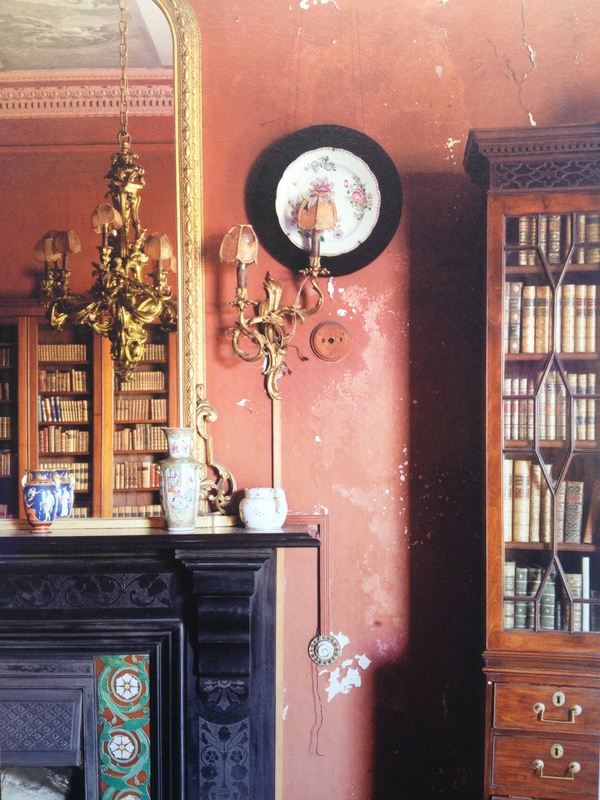 A most beautiful book featuring many other houses beside Stradbally, either small or big – in town as well as in the countryside – but all with a true unmissable “soul”. It is an endless pleasure to get lost through its pages! Thank you Giuseppe, your generous support is greatly appreciated. I hope that we will yet have the pleasure of meeting. Dear Robert. You mentioned the topographical painting of Stradbally. I know of two others; Mount Ivers Co. Clare, and Howth Castle. Do you know of any more ? I would dearly love to study this subject in more detail. There was an article in History Ireland concerning the Stradbally painting some years ago. I wonder whether they were a depiction, or a depiction with ideas for further improvement. Furthermore whether these three are comparable in date and style. Your help would be appreciated. Thank you for getting in touch about this. I will have to give this some thought: if you don’t hear from me for a while, please write again. 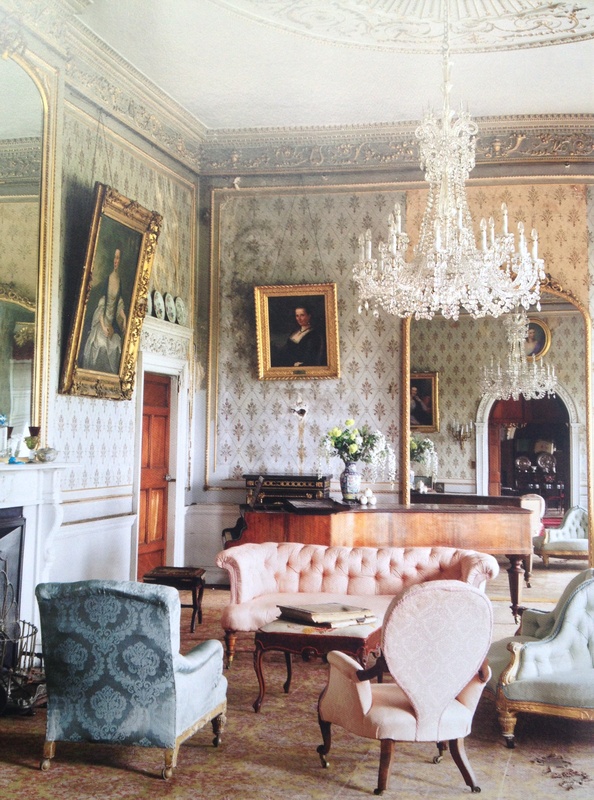 Just found this article and pictures of Stradbally Hall, I was invited with my husband and mother there in May of 2003 by Adrian for an afternoon visit, distant relations from my father’s side of the family. Took lots of pictures and made a 90 minute film, really enjoyed seeing your pictures and reading your description of the house. Thank you, I am delighted you have enjoyed learning more about Stradbally. Thank you so much for the reply and assistance. I have tracked down the genealogy, but am now keen to see where she lived and what she looked like.